Milwaukee and Lake Geneva, Wisconsin are quickly becoming hotspots for corporate events, outings and conventions. This reputation is being established through a centralized location, convenient travel options, and cost-effective hotel space, restaurants and entertainment. Milwaukee is headquarters to some of the most recognizable brands in the United States, including Harley Davidson, Kohl’s Department Stores and the Miller Coors Brewing Company. As its corporate footprint continues to grow, Modern Event Rental serves the Milwaukee and Lake Geneva, Wisconsin areas with our wide variety of meeting rentals and trade show rentals. Our high-quality and affordable meeting rentals are custom built in our Chicago warehouse and can be tailored for any size client. For your convenience, we offer nationwide shipping, ensuring our event rentals will make it to your Milwaukee event venue in plenty of time. If you need help with the set up, we also deliver across the Midwest and our event professionals will work quickly and efficiently to ensure your Milwaukee-area corporate event runs smoothly. We offer lighting, audio/visual, stages, lounge furniture and pipe and drape ideal for any Milwaukee trade show, convention or corporate meeting. We service many of the top Milwaukee convention and event destinations, including the Milwaukee Art Museum, Wisconsin Center, numerous downtown and suburban hotels and the Grand Geneva Resort & Spa in Lake Geneva. Modern Event Rental is also a member of the Wisconsin Chapter of Meeting Professionals International, and we work closely with Milwaukee and Lake Geneva event planners. If you’re planning a convention, corporate event or outing in Milwaukee or Lake Geneva, let Modern Event Rental handle all your furniture, audio/visual and pipe and draping needs. Contact us today! 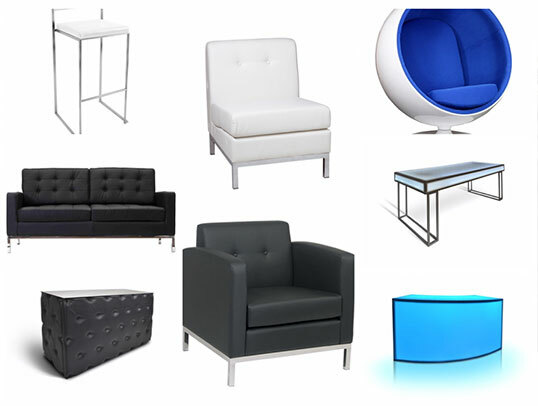 Need event rental furniture and more in Milwaukee? Contact us today to learn more about our event rental items and services.